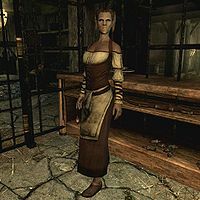 The Dealer is a Bosmer found behind a gated counter in Redwater Den, where she sells Redwater Skooma. She wears a set of barkeep clothes and shoes and carries a small amount of gold, as well as a Redwater Den Backrooms Key. When you first arrive at Redwater Den, she'll welcome you: "Ah, welcome, welcome! I don't believe we've seen you here before, have we? You can buy from me, then join any booth you'd like." You can attempt to persuade her to give you a sample of her product. If your Speech skill is high enough, she'll give in by reluctantly responding "Since it's your first time... sure. Find a booth and enjoy" or by asking you to be discreet: "Well... so long as you don't tell anyone. Here take it and slip into a booth before someone notices." However, asking her for a sample when your speech skill is too low will result in an offended reply: "How about you pay for your habit like everybody else. We're not running a charity here." When you leave Redwater Den, she'll call out to you as you go: "Don't leave, you'd have better dreams here..."
This page was last modified on 31 March 2013, at 21:01.